This species is accepted, and its native range is Medit. to Central Asia and Indian Subcontinent. It is used to treat unspecified medicinal disorders. An erect, branching, sparingly pilose annual. Stipules often with a small tooth near the base; petiole up to 2 cm. long; rhachis ± 5 mm. long; leaflets cuneate-oblong or lanceolate, up to 25 mm. long by 9 mm. wide, coarsely toothed, rounded at the apex. Racemes many-flowered, up to 10 cm. long, including a peduncle of up to 3 cm. ; bracts subulate, ± 0·5 mm. long; pedicels ± 1 mm. long, reflexed after flowering. Corolla yellow, ± 2·5 mm. long. Pod 3–4 mm. by 2–3 mm., 1-seeded, with prominent reticulate veins. Weed of cultivation; ± 2000 m.; rainfall 900–1300 mm. Naturalizada en Colombia; Alt. 700 - 2824 m.; Andes. Erect, much branched, slender annual herb. Leaflets up to 25 × 9 mm, shortly cuneate-oblong or lanceolate, rounded at the apex, denticulate around the upper half or more; stipules lanceolate-subulate, entire, sometimes denticulate near the base. Racemes slender, many-flowered, at first compact and cylindrical, later elongating and laxer; peduncle up to 3 cm long. Flowers with pedicels c. 1 mm long, reflexed in fruit. Calyx c. 1 mm long; teeth narrowly deltoid, subequal, thinly hairy. Corolla yellow, ± twice as long as the calyx; standard c. 2.5 mm long, emarginate at apex; wings subequalling the keel, with small auricles; keel c. 2 mm long. Pod 2–3 mm long, globose-ovoid, strongly reticulately veined, 1-seeded. Alt. 700 - 2824 m.
Melilotus brachystachyus Willd. ex Spreng. Porter, D.M., Murrell, G. & Parker, J. (2009). 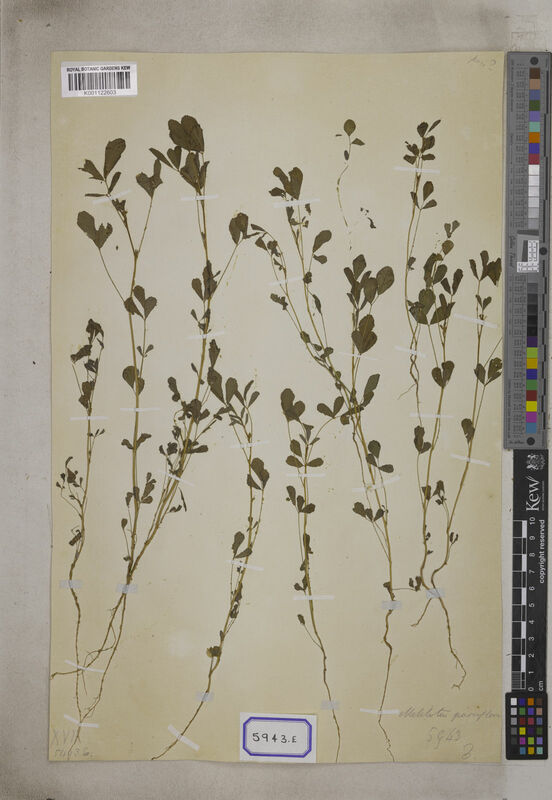 Some new Darwin vascular plant specimens from the Beagle voyage Botanical Journal of the Linnean Society 159: 12-18. Bak. 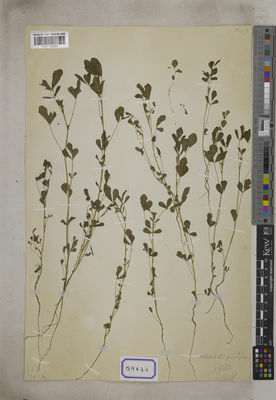 f., Leguminosae of Tropical Africa: 74 (1926). All., Fl. Pedem. 1: 308 (1785).